Combined with the new Worcester Bosch Renewable Energy Products, underfloor heating can significantly reduce your home heating bills by as much as 40%. Overlay Floor Central Heating System. 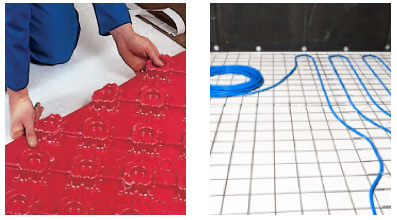 Overlay installations allows ‘underfloor heating' to be installed as a “built on” rather than “built in” solution. This can be a particular advantage where access during construction presents difficulties. Overlay works in the same way as underfloor and is connected to manifolds and controls like other floor heating systems for whole floor installations alternatively it can be used for single room solutions, e.g. conservatories, bathrooms or loft conversions.